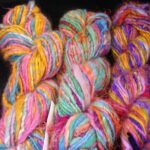 Handspun Hand dyed Angora Merino Yarn, Bulky wt. 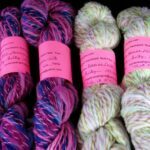 Handspun hand dyed merino angora yarn. 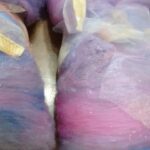 Handspun hand dyed angora/ merino yarn. 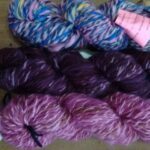 These yarn are perfect for weaving/ knitting or crochet. 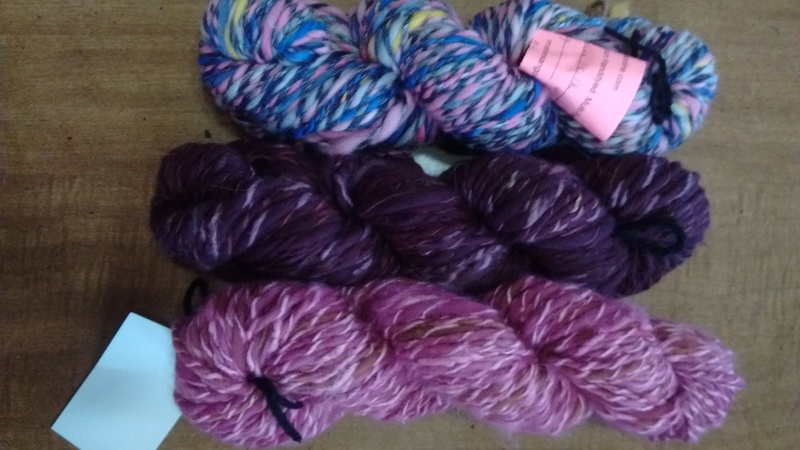 All skein are slightly thick n thin yarn, **** description follows below as pictured from top to bottom per skein: *Use options menu to select skein. skein #1: handspun hand dyed yarn made with merino/ silk, slightly Thick N Thin, bulky wt.,124 yd., in rose pink, silver, violet, burgundy yellow., 3.6 oz. skein #3: handspun yarn made with angora/ merino yarn, one ply of each fiber, bulky wt, 94 yd. 3.2 oz. in pink / golden brown/ rose pink.